Often guests express surprise when we tell them that we, like most B&B’s (at least in the southern half of Maine) are open year ’round. The natural assumption is that our season from November through April is fueled by either skiing or shopping. In Freeport, of course, shopping is always available, with the five L.L. Bean stores (four of which are open 24-hours a day, 365 days each year), and over 160 other shops and restaurants, most located in historic buildings, and almost all within a few blocks walk. Downhill skiing is a bit trickier, though there are plenty of places for cross-country or for snowshoeing in the area. Probably the nearest downhill ski area is in Camden, about 90 minutes up US-1, with real mountain ski slopes about 2 hrs away in the western part of Maine. So what is there to do (in addition to the shopping) between November and April? Plenty! Freeport’s Girlfriend Getaway is November 13-15, with special lodging packages and activities. L.L. Bean’s Northern Lights celebration begins November 20, running through New Years’ Day. This includes the huge L.L. Bean Christmas Tree, carriage rides, and activities throughout Freeport. Thanksgiving weekend (November 26-29) starts the “offical” Christmas shopping season with an all-you-can eat buffet at the Maine Dining Room in the Harraseeket Inn, Christmas decorations, and more. Moonlight Madness shopping begins at midnight on November 27. December starts with Sparkle Weekend in Freeport – always the first weekend in December, and filled with winter fun! There is a Christmas parade, with Santa arriving on a lobster boat, a talking Christmas tree, a tuba concert of seasonal favorites, the Freeport Community Players present “Radio IV”, a long-time favorite drama, and there are sales and other events to charm every visitor. New Year’s Eve is traditionally a magical time at L.L. Bean in Freeport, with entertainment for the whole family, storytellers and music, and a midnight fireworks display. And, of course, with all the magnificent shopping in Freeport, there is something for every budget and every taste in the stores and shops, both before Christmas, and with the after-Christmas sales. If you think you’ve seen good after-Christmas sales, wait until you visit Freeport in January (and even into February). We’ve seen unbelievable markdowns as merchants clear the way for the next season’s merchandise. 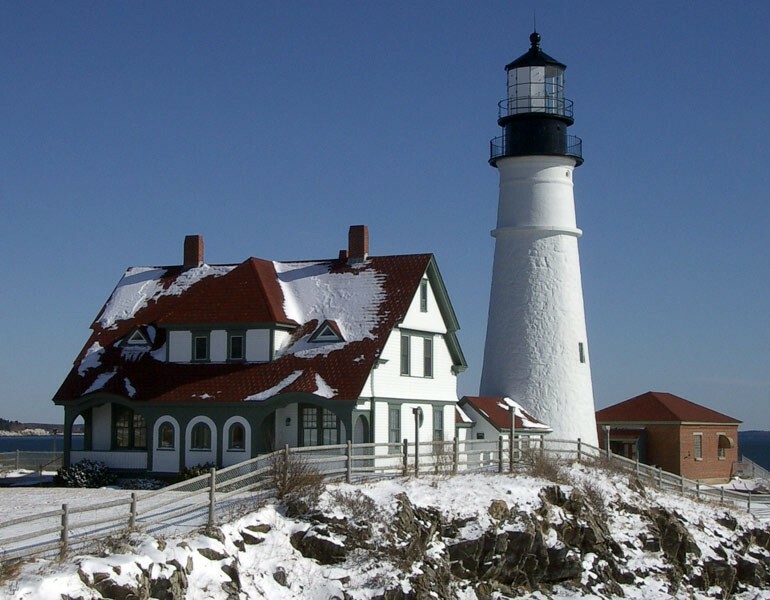 January, with its snows and often clear days, makes a wonderful time to visit some of your favorite lighthouses, and get those rare photos of them with a dusting of snow on the rocks around them. Like January, February brings sales to town, and of course, special opportunities for short breaks and getaways with Presidents’ Day weekend, Valentines Day, and more late-season sales. The lighthouses and coastal scenes are still beautiful, with wind, water, waves and snow. In March the snow begins to melt and the first signs of Spring appear. It can still be a great time for seeing the new growth around the coastal areas and lighthouses, but it is also a good time for some early-season shopping. Like March, April can have some wonderful photo opportunities with new foliage and flowers appearing, melting snows, and beautiful, rugged, coastlines. April is also the month for Flavors of Freeport, a wonderful food-inspired event, with all kinds of activities to enjoy. So, yes, there is life after autumn in Freeport! Try one of our beautiful off-season months and enjoy off-season room rates, specials and activities!